Another visit to the fabulous Castle Barn at Wasing Park, this time to install a star-shaped fairy light canopy with uplighting. Even though this photo was taken during daylight hours it still looks great, but it really came to life in the evening. The fairy lights were dimmed slightly for a gorgeous, soft sparkle above the dance floor while the uplighters gave a warm pink glow to the room, matching the bride’s colour scheme. There are lots of other options for lighting at Wasing Park. 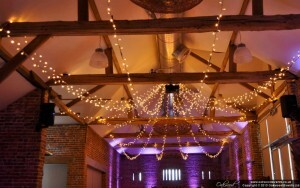 Festoon lights, paper lanterns, dance floor lighting and outdoor lighting on the patio area all work really well. Contact us to discuss the options for lighting your special day at Wasing!